Italian artist Giuseppe Percivati is in Hot Springs this week doing a commissioned mural for the city. Giuseppe contracted me to create a video for his sponsor of the experience, and of course I'm shooting stills as well. From the Rotary Club newsletter: Don Gooch, Mary Neilson, and Neal Harrington of the 100thAnniversary Project Team, were pleased to present their gift to Hot Springs commemorating our 100 years as the “downtown” Rotary Club. In 1818 the Quapaw Indians CEDED the land around the hot springs to the United States in a treaty after being forced to a reservation south of the site. The mural is a celebration of the Quapaw tribe, a peaceful people, who, along with other tribes, always regarded the hot springs as an area of rest and peace. The tribes would put aside their weapons and benefit from the healing waters while in this valley. The mural will be painted on the wall located down from the Exchange Parking Garage walkway which now shows rather faded GWG scenes. This wall was not our original location so the design will be modified to conform to the wall’s dimensions. There will be a poem placed in the center that is from the Quapaw Tribe. A plaque commemorating our 100th Anniversary will also be placed on the wall. Pepe is a soft spoken, gentle spirit and it is a pleasure to work on this project with him. More pictures as they happen! Tonight was Flavor of the Park in downtown Hot Springs. 25 different vendors from Pizza to Barbecue to cupcakes under one (parking garage) roof! I wandered about the grounds and just photographed the sights around me. Hot Springs has something for everyone every week of the year! The lovable Maxwell Blade, Magician! This is a $6500 camera rig kid... Make sure the balloon stays in your hand! I promised them I would post this. Next year I'll know to wear a wetsuit and bring an underwater housing for the Sony! Lakeside Middle School Career Fair! When I was a senior in high school, we had a career day featuring members of the community in various professions. I went to the photography lecture, naturally, and the speaker was really down on photography as a profession. He talked about how little money there was in the business, and how it was easier to be an artist with a camera rather than learning how to draw or paint. That talk haunted me for years, and might have kept me from pursuing a fulltime career in photography. So when Jennifer Carlton at Lakeside Middle School asked me to participate in their career fair, I jumped at the chance to speak the truth to the young minds about my career of choice. "What are the pros and cons of photography?" "Fun and no money." I really enjoyed encouraging the class to go beyond photography and get a degree in business, and to take art courses to learn composition and structure. Students posed for impromtu demonstrations of how my Boomerang Flash with MagMod deflector worked. I had dispensed literally tens and tens of dollars worth of valuable advice to these aspiring artists! I look forward to the opportunity to speak again at the next event. I was actually sorry when it was time to pack up and go. 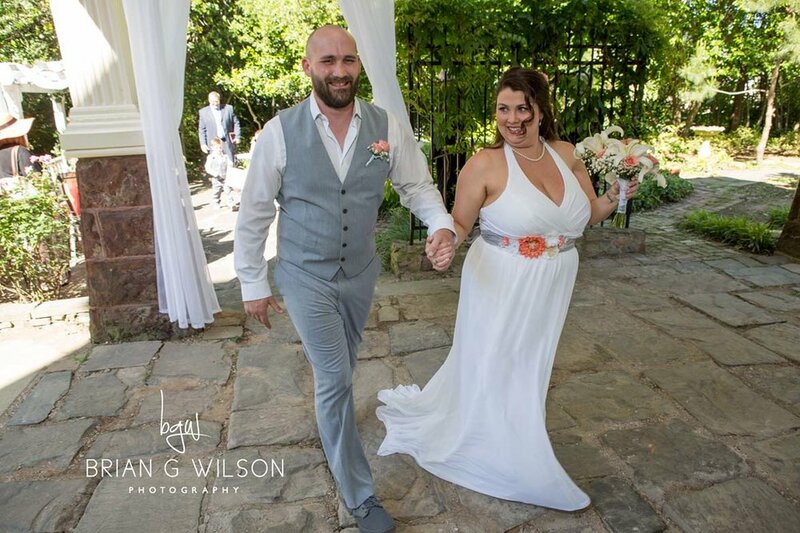 Here are a few highlights from the Fox-Luttrell wedding held May 6 at the 1890s Williams House in Hot Springs. Beautiful weather, beautiful bride, beautiful everything! Starting today, I'm offering the Hot Springs community top quality headshots for only $99. The only difference between this offer and my usual $249 price is there won't be a print included and we ask that you stick to one outfit change. We'll get through the shoot in about 30-45 minutes instead of 60+ minutes, and you'll get your proofs the same day. Contact my studio at 501-538-0810 for an appointment, or email at me@bgwphoto.com for more information. Look Sharp! Last night I had the pleasure of shooting portraits at the Cutter Morning Star High School Senior Prom, which was held in the Hamp Williams builing (where my studio is upstairs) in Hot Springs, Arkansas. When I was a junior in high school, I was assigned to shoot the senior prom because the senior photographer was attending prom, without a camera, of course. Now I've come full circle 43 years on, and I felt like a teen again. I am really proud of these great kids that I have come to know this year, and what a bunch of cuties! Check these out! Friday (4/21) I had the opportunity to shoot a destination wedding in Hot Springs for Randi and Waylon Gibson, from Stigler, Oklahoma. The afternoon started off with a session in my studio, and a quick trip a mile away to the park across from the Arlington hotel and spa. Shooting in the dappled sunlight beneath the trees was an exposure challenge, but the results were pleasing. What a great way to close out a busy week! I must admit I woke up at 4:30 this morning editing the pictures in my head... I got out of bed at 5:00 am and got after it! I've never understood why some photographers state they'll have the pictures ready in 4-6 weeks... I want them done ASAP! Hopefully, you do too! As the expression goes, "Good photography is never cheap. Cheap photography is never good." For the most part, that is true. Lately I find myself being underbid for weddings by cheap photographers (in the $200-1500 range), or by someone with a "friend with a nice camera". Today's marketplace is overpopulated with people who got a "nice" camera for Christmas, and with the help of a Facebook business page and some Instagram filters, boom! They're professional photographers! I charge about $2500 for an eight hour wedding, including some perks like a canvas wrap print, online gallery, crystal usb in a satin box, etc. So how can some photographers cost $500 and make a living? Truth is, they can't. Unless they have a day job, live with their parents or have a sugar daddy, they can't make a living on a $500 wedding. Here's a reality check for anyone considering an inexpensive wedding photographer. Let’s start by looking at a broad number: 35%. According to the Professional Photographers Association of America, that’s the target profit margin for a wedding photographer. The target. Many make less. So, for every $1000 that a photographer charges, figure he’s probably taking home $200-$350 after expenses. Of all the vendors you hire for your wedding, your photographer will have the greatest overhead. I carry $20,000 worth of equipment to a wedding… equipment that gets broken and must be repaired or upgraded. I have a studio, utilities, a website, marketing expenses, a million dollar liability policy, indemnity insurance, a business license, federal, state and local taxes to pay. That’s where 65%-75% of your money goes. But it’s not one day’s work. It’s a week of work. Unlike the other vendors at your wedding, when the wedding is over your photographer is just getting started. First, let’s not forget the 2-3 hours he has spent meeting with you before the wedding. Add another 5-6 hours if you had an engagement session. Then there’s the 7-10 hours of work on the wedding day. Finally, there can be as much as 20 hours of post-production work on a typical wedding. So, that $875 is now a week’s salary, not a day. Anyone shooting at $200-$1200 is not making a living as a photographer. They are a student, or they have another job. Sometimes they are building a portfolio towards being a full-time photographer. God bless them, everyone needs to start somewhere, but they would be well served to start as a second shooter for an experienced photographer. A cheap photographer will often not have the professional equipment needed to do a wedding properly. "You're just being an equipment snob!" you might say. But I can tell you that a prosumer camera bought at Sam's is not going to have the low light capabilities in that dark, candlelit church that my $3500 cameras have. That is why, when you look at the website of a low-end photographer, you will see so many pictures that were taken outdoors, without a flash. Their indoor pictures don’t look good because they don’t have the right gear. Add to all of this the fact that I carry two of everything and you can see where the costs start to mount up. The cost of this level of expert equipment is passed along to the client. So, just because a photographer charges more doesn’t mean he makes more. My wedding. Our photographer was shooting large format, too. What a waste. Didn't know his guide numbers. When we got married in 1981, we were too poor to pay attention. Fortunately, I had a mother in law who was a wedding cake baker by trade, and the venues, dresses, and flowers were donated to us. Our wedding photographer was a nice gentleman who was friends with my mother. He was a weekend wedding photographer, an advanced hobbyist, to put it kindly. He shot our wedding for $95 for 95 5x7 prints ($253.87 in 2017 dollars). There were a few good pictures. There were even more that weren't. Blurry, awkward, out of focus, underexposed pictures. Some moments were missed entirely like the first kiss. It was such a disaster that we never made a wedding album. That's right, a wedding photographer without his own wedding album. This was my favorite picture from my wedding, and my hired photographer didn't even take it. Rather, this was taken with my camera by some random dude walking by while we were waiting to leave on the honeymoon. Okay, so I'm getting an early start. "I'm an available light photographer!" ...It means, "I don't own a flash or if I do, I don't know how to use it." "I'm an on-location photographer!"... This is obvious: " I don't own a studio." "I am passionate about photography! "....Passion is no substitute for experience. "I LOVE LOVE LOVE photography!" ....A variation of the above, and love don't pay the rent. "I love Jesus and photography!" ......I'm not risking Hell by commenting on this one. "I specialize in Family Portraits, Teens, Weddings, Maternity, Pets, Boudoir, Sports, Commercial, Nature Scenes and everything in between!" ....Please look up "Specialty". Any "photographer" that also sells Arbonne, Mary Kay, Amway, Shaklee, Beauty Control, or any other MLM on their website. I'll add to the list as necessary. Good day.